and beverage solutions that taste delicious! Stevia Leaf Extract is derived from the leaves of a plant species known as Stevia Rebaudiana which can be up to 300 times sweeter than sugar. 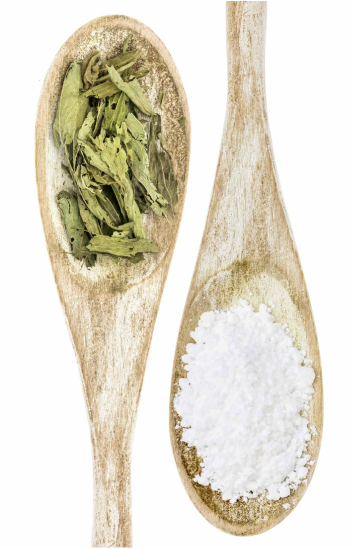 Use of the plant as a sweetener dates back 1,500 years, where it was traditionally used by the Guaraní peoples of South America to sweeten local teas and medicines. Today, Stevia leaf extract is approved for use as a sweetener to replace sugar in many parts of the world including Canada, the US, Latin America, Europe, Australia, New Zealand and Japan. The problem with Stevia is that it leaves a very bitter aftertaste in the mouth, denaturing the taste of the recipe you add it to, and remains extremely challenging for manufacturers to integrate it into their food and beverages without adding masking agents, sugar and/or other sugar substitutes. Recent advances involving further purification and isolation of the sweetest compounds found in Stevia Leaf Extract (known as Steviol Glycosides such as purified Reb A, Reb D and Reb M), or biosynthesis methods involving genetically modified baker's yeasts, only add to the complexity and cost of integrating Stevia into food and beverages. Plus, these advances are far from natural. There are a growing number of health-conscious consumers who seek foods and beverages that have "clean labels" without excess sugar, artificial flavors, synthetic additives and sweeteners commonly found in processed foods on grocery store shelves. Yet, these same consumers are not willing to compromise on taste! How can food and beverage manufacturers successfully integrate natural zero-calorie sweeteners such as Stevia AND maintain or improve upon the great taste of their most prized brands while limiting the added sugar and synthetic ingredients on the label? Thanks to the financial aid and business guidance received from PME MTL West-Island, AmazStev can accelerate distribution, develop the production scale-up process and prepare for the next round of financing. Food manufacturing or food processing SME.